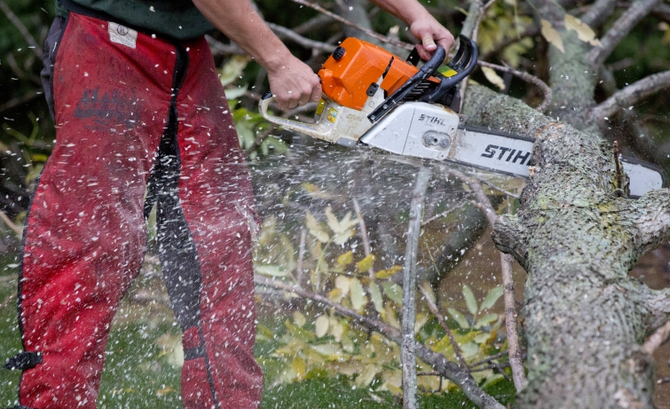 Hire a tree trimmer that has safety on the mind. When you are considering hiring a professional tree services company the one thing most homeowners overlook is safety. A company that practices safe trimming and removal of trees is going to be a better choice for you in the long run. Companies that are safety conscious can keep costs low thru lower insurance and work comp costs, passing these savings on to their customers. On the job Safety has several components, from employees wearing the proper clothing and protection for the job they are tackling to the use of specialized equipment. Taking proper care of tools and maintaining them in good working condition shows a potential client this company is serious about getting the job done right and ensuring a safe working environment. Chainsaws, a variety of types and sizes of chainsaws are available. Different lengths of blades and different types of chains have their own purposes. These tools are the most important in a tree trimmer’s tool box.Loppers or branch trimmers, especially useful for pruning fruit trees, nut trees, and vines. This tool is really similar to a pair of hand shears but the blades are thicker and the handle is much longerPruning Saws, Most are capable of taking on branches from about 1 ½ to 5 inches in diameter and are available in many different styles.Pole Pruner, To reach dead wood in trees or for light pruning. The best part is that most pole pruners can reach 8 feet or more, eliminating the need for a ladder in many casesLadders, a tree trimmer would rely on sturdy non conductive ladders daily. A non conductive ladder is a safety measure taken when power lines may come into play. Boom Trucks, when a ladder just won’t cut it a tree services company may bring in a boom truck. A boom truck allows freer movement for the tree trimmer to get safely higher up in the trees canopy. Roping systems, from time to time the best way to tackle a large tree is to climb it. If you climbed trees as a child you know how dangerous this can be. A professional experienced tree trimmer will have harnesses and ropes and a vast amount of experience using these set ups.Safety clothing, Tree trimmers wear protective clothing like leather pants to reduce the chances of being cut by a saw or poked by a branch.Cross Cut Saws hand operated, Crosscut saws require two people because each end of the saw has a handle. Each person should stand on one side of the tree and hold it at a 45 degree angle before sawing. Crosscut saws come in varying lengths, so choose the length correlates with the tree diameter you will be removingStump Grinders, Once the tree is gone you may still have to deal with the stump. Professional stump grinding equipment makes quick work of this and will grind any size stump below the grade level of your lot. If you live in the Twin Cities and you are in need of a professional Tree Trimming Services Company contact Ivan’s Tree Service, professional experienced in all aspects of tree services.